Through the vision of Doc Bredekamp, the Alumni of the Beta Pi Chapter have strived to continue the goals of the Fraternity: to build better men. Beta Pi alumni stay actively involved with the Chapter through annual organized events such as Winter Carnival and Homecoming, the Summer Golf Outing (hosted by Brother Kneen), and other informal activities. Alumni also stay involved with the Chapter through advisory roles through the Alumni Corporation Board (ACB), where we provide active assistance to the Chapter. In conjunction with our 60th anniversary in 2008, ACB established the VAC Fund as a method for alumni to voluntarily contribute to the Chapter on an ongoing basis after their time as an active has ended. The Beta Pi Club is the highest level of automatic monthly donation. 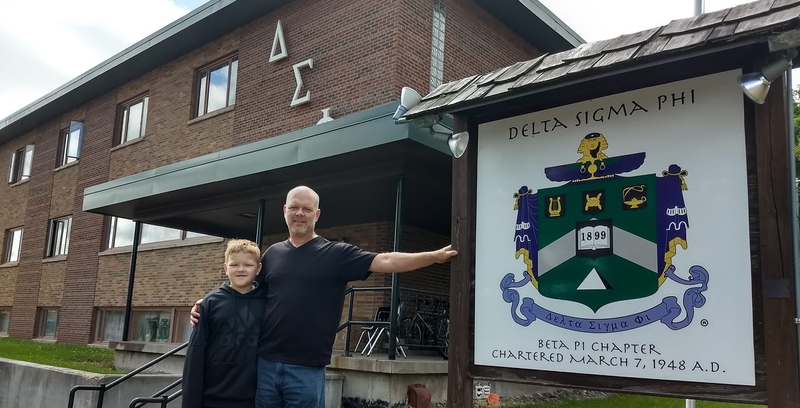 You help keep the cook in the kitchen, the boiler kicking out the extra heat during all-nighter, and the sauna operational so that the next generation of actives have a chance to tell similar stories of Beta Pi. In commemoration of our 70th anniversary, Beta Pi Club members will give a gift of $70 every month ($840 per year). Beta Pi Club Members will receive special recognition for their generous and ongoing gift. For those of you who did not know Jim Jones, he was a brother of Beta Pi who passed into Bond Eternal. Upon his passing Jim left a very generous gift to Beta Pi. Jim Jones Club members will give a gift of $30 every month ($360 per year) in commemeration of Jim. Jim Jones Club members will receive special recognition for their generous and ongoing gift. You survived living at 1421. Which room was yours? What did you paint on the door? 1421 Club members will give a gift of $14.21 every month ($170.52 per year) in commemeration of living in the “best location on campus”. 1421 Club members will receive special recognition for their generous and ongoing gift. Gifts, like pearls of wisdom, can cost both a great price and your time to tell its story. When inspiration hits, we’re here to hear about it. One time gift givers will also receive recognition for their generous gifts. One-time gifts can be processed without requireing a Paypal account. ACB was founded with the goal of ensuring that the Chapter always has assistance in their operations. ACB is incorporated in the State of Michigan and oversees Chapter activity, including finances and goal planning. ACB is composed of an elected board (President, Secretary, Treasurer), the Chapter President, Chapter Treasurer, and other alumni. ACB members are nominated and elected at the annual meeting in April of each year, and serve terms of varying length (usually 1-3 years), and it’s common for alumni to serve multiple terms consecutively. Winter Carnival – February each year in Houghton. Homecoming – October each year in Houghton. Golf Outing – July each year in the Metro-Detroit area. If you are interested in attending an event, let us know! Visit our Facebook page to keep up-to-date with current events and to find the date and time of the next gathering!